May | 2015 | Global Treatment Services Pvt. Ltd.
Cholecystectomy is not indicated in most patients with asymptomatic stones because only 2-3% of these patients go on to become symptomatic per year. To properly determine the indications for elective cholecystectomy, the risk of the operation (taking into account the age and comorbid factors of the individual patient) must be weighed against the risk of complications and death without operation. The widespread use of diagnostic abdominal ultrasonography has led to the increasing detection of clinically unsuspected gallstones. This, in turn, has given rise to a great deal of controversy regarding the optimal management of asymptomatic (silent) gallstones. Patients who are immunocompromised, are awaiting organ allotransplantation, or have sickle cell disease are at higher risk of developing complications and should be treated irrespective of the presence or absence of symptoms.  Morbid obesity is associated with a high prevalence of cholecystopathy, and the risk of developing cholelithiasis is increased during rapid weight loss. Routine prophylactic cholecystectomy prior to gastric bypass (RYGB) is controversial, but cholecystectomy should clearly precede or be performed at the time of RYGB in patients with a history of gallbladder pathology. Biliary colic with sonographically identifiable stones is the most common indication for elective cholecystectomy. Acute cholecystitis, when diagnosed within 72 hours from the onset of symptoms, can and usually should be treated by surgery. Once 72 hours pass after the onset of symptoms, inflammatory changes in the surrounding tissues are widely believed to render dissection planes more difficult. 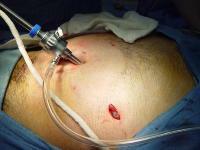 Interval cholecystectomy after 4-6 weeks or percutaneous cholecystostomy are other options. Biliary dyskinesia should be considered in patients who present with biliary colic in the absence of gallstones, and a cholecystokinin–diisopropyl iminodiacetic acid (CCK-DISIDA) scanning should be obtained. The finding of a gallbladder ejection fraction <35% at 20 minutes is considered abnormal and constitutes another indication for cholecystectomy. Cholecystectomy can be safely performed during the same hospitalization after the clinical signs of mild to moderate biliary pancreatitis have resolved. Patients diagnosed with gallstone pancreatitis should first undergo imaging to rule out the presence of choledocholithiasis. Cholecystectomy should be delayed in cases of acute moderate to severe biliary pancreatitis (5 Ranson criteria). P.L. Mirizzi described an unusual presentation of gallstones that, when lodged in either the cystic duct or the Hartmann pouch of the gallbladder, externally compressed the common hepatic duct, causing symptoms of obstructive jaundice. Although an initial trial of dissection may be performed by an experienced laparoscopic biliary surgeon, one must be prepared for conversion and for biliary reconstruction. Gallbladder cancer may be an incidental finding at cholecystectomy, with an incidence ranging from 0.3-5.0%. Uncertainty of diagnosis, uncertainty of the degree of tumor spread, or postoperative identification of cancer on pathological examination of a routine cholecystectomy specimen should engender early reoperation. Before reoperation, distant metastases should be excluded by a detailed clinical examination including a per-rectal/per-vaginal examination, examination for supraclavicular lymph nodes, and CT/MRI of the chest and abdomen. Cholecystectomy is a safe and effective treatment for most children diagnosed with biliary disease (BD). Cholecystectomy in safe in patients with Child class cirrhosis. The presence of diabetes mellitus, in and of itself, does not confer sufficient risk to warrant prophylactic cholecystectomy in asymptomatic individuals. However, consider that acute cholecystitis in a patient with diabetes is associated with a significantly higher frequency of infectious complications such as sepsis. The treatment of biliary colic or uncomplicated cholecystitis in a pregnant patient is conservative management followed by elective cholecystectomy. Using antibiotics, analgesics, and antiemetics help most pregnant women avoid surgical intervention. Surgery is generally indicated for patients with recurrent acute cholecystitis who have failed maximal medical therapy. Classically, the second trimester is considered the safest time for surgery. This is because of the findings of increased risk for spontaneous abortion and teratogenesis during the first trimester, and the increased risk for premature labor and difficulties with visualization in the third trimester. Pregnancy was formerly considered to be an absolute contraindication to the laparoscopic approach because of concern for potential trocar injury to the uterus and the unknown effects of pneumoperitoneum to the fetal circulation. However, this has not been borne out in the literature, and cholecystectomy is now considered safe. Recommendations for pregnant patients who undergo laparoscopic cholecystectomy include placing them in the left lateral recumbent position to shift the weight of the gravid uterus off the vena cava and maintenance of insufflation pressures between 10 and 12 mm Hg. In addition, maternal PaCO 2 monitoring must be performed by measuring either arterial blood gases or end-tidal CO 2 , but arterial PaCO 2 may be more accurate. Other recommendations include avoiding rapid changes in intraperitoneal pressures, avoiding rapid changes in patient position, and using open technique for the umbilical port placement.  In patients with dilated common bile duct or raised liver functions, MRCP or ERCP may be indicated based on availability. Alternatively, an on table cholangiogram or CBD exploration may be done during surgery. Patient can be referred to another centre in case of non availability of expertise or experience.  Safe access to abdomen.  Clear definition of anatomy in the calots triangle showing either the continuity between cystic duct and gall bladder or junction between cytic duct and common bile duct.  Avoiding diathermy close to common bile duct.  Securing cystic artery safely and close to the gall bladder.  Dissection from liver bed staying close to gall bladder.  Early conversion to open procedure in case of a difficult laparoscopic surgery.  Common bile duct stones if no facilities for management available.  Suspected gall bladder cancer.  Bile duct injury during surgery. Patient should be referred to a tertiary centre as soon as possible. 2. When to suspect/ recognize? a. Introduction: Blunt abdominal trauma (BAT) is an increasingly common problem encountered in the emergency department. The usual causes of BAT include vehicular accident, assault, falls, sports injuries and natural disasters. b. Case definition: BAT is suspected in any patient involved in above situations and presents with abdominal pain, distention or shock. It should be looked for in patients of polytrauma. 3. Incidence of the condition in our country: One study has reported 2.1% incidence of BAT amongst all surgical patients admitted to a tertiary hospital during 1 year. 4. Differential diagnosis:Abdominal trauma forms adifferential diagnosis of any patient presenting with acute abdomen. 5. Prevention and counseling: Use of appropriate safety measures during various activities associated with BAT can significantly reduce its incidence. viii. In case the intra-abdominal injuries are extensive, patient is very sick and OT facilities/ surgeon’s experience is suboptimal, Damage Control Surgery may be done. Definitive surgery should be done subsequently under improved circumstances or at a higher center. IV. Referral criteria: After Damage Control Surgery if the local facilities are inadequate. a. Doctor: Does initial evaluation, subsequent monitoring, decision regarding investigations and therapeutic intervention. b. Nurse: Assists in resuscitation, monitoring, investigation and treatment. c. Technician: Assists in resuscitation, investigation and treatment. b. Joint theatre Trauma System Clinical Practice Guideline: Blunt abdominal trauma. c. M. Swarnkar, P. Singh & S. Dwivedi : Pattern Of Trauma In Central India: An Epidemiological Study With Special Reference To Mode Of Injury. The Internet Journal of Epidemiology. approach to deliver superb care and compassion. In India uses the most advanced minimally invasive surgical innovations and technology to cure the patients. Primary prevention refers to a reduced or to eliminate exposure to carcinogens. Secondary prevention includes screening programmes. Opportunistic, in which the population seeks medical professionals. Organized, in which medical professionals approach the public. The pathology confronted by neurosurgeons could be either congenital, acquired, traumatic, due to infection, or neoplastic or degenerative conditions. Conditions like congenital hydrocephalus, pediatric tumors and myelomeningocele are encountered in children. Trauma with head or spine injury and bleeds due to arteriovenous malformation are encountered in young adults. Degenerative spine disease, aneurysm bleeds and Parkinson’s disease are encountered in much older patients. The science of neuropathology is a well developed branch of pathology. Neuroanesthesia is a highly developed science that is linked to neurosurgery. This branch of medicine plays a very important part in day-to-day neurosurgery. 1. Vascular and endovascular neurosurgery. y plays a key role not only in diagnosis but also in the operative phase of neurosurgery. Neuroradiology methods are used in modern neurosurgery diagnosis and treatment. They include computer assisted imaging computed tomography (CT), magnetic resonance imaging (MRI), positron emission tomography (PET), magnetoencephalography (MEG), and the stereotactic radiosurgery. Some neurosurgery procedures involve the use of intra-operative MRI and functional MRI. Microsurgery is utilized in many aspects of neurological surgery. Microvascular techniques are used in EC-IC by-pass surgery and in restoration carotid endarterectomy. The clipping of an aneurysm is performed under microscopic vision. Minimally invasive spine surgery utilizes microscopes or endoscopes. Procedures such as microdiscectomy, laminectomy, and artificial disc replacement rely on microsurgery. Using Stereotaxy neurosurgeons can approach a minute target in the brain through a minimal opening. This is used in functional neurosurgery where electrodes are implanted or gene therapy is instituted with high level of accuracy as in the case of Parkinson’s disease or Alzheimer’s disease. Using the combination method of open and stereotactic surgery, intraventricular hemorrhages can potentially be evacuated successfully. Minimally invasive endoscopic surgery is commonly utilized by neurosurgeons when appropriate. Techniques such as endoscopic endonasal surgery are used in pituitary tumors, craniopharyngiomas, chordomas, and the repair of cerebrospinal fluid leaks. Ventricular endoscopy is used in the treatment of intraventricular bleeds, hydrocephalus, colloid cyst and neurocysticercosis. Endonasal endoscopy is at times carried out with neurosurgeons and ENT surgeons working together as a team. Repair of craniofacial disorders and disturbance of cerebrospinal fluid circulation is done by neurosurgeons who also occasionally team up with maxillofacial and plastic surgeons. Cranioplasty for craniosynostosis is performed by pediatric neurosurgeons with or without plastic surgeons. Neurosurgeons are involved in Stereotactic Radiosurgery along with Radiation Oncologists in tumor and AVM treatment. Radiosurgical methods such as Gamma knife, Cyberknife and Novalis Shaped Beam Surgery are used as well. Endovascular Neurosurgery utilize endovascular image guided procedures for the treatment of aneurysms, AVMs, carotid stenosis, strokes, and spinal malformations, and vasospasms. Techniques such as angioplasty, stenting, clot retrieval, embolization, and diagnostic angiography are endovascular procedures. 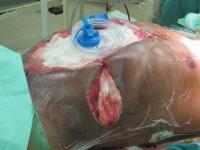 A common procedure performed in neurosurgery is the placement of Ventriculo-Peritoneal Shunt (VP Shunt). In pediatric practice this is often implemented in cases of congenital hydrocephalus. The most common indication for this procedure in adults is Normal Pressure Hydrocephalus (NPH). his procedure is known aa a discectomy. A laminectomy is the removal of the Lamina portion of the vertebrae of the spine in order to make room for the compressed nerve tissue. Radiology assisted spine surgery is a minimally-invasive procedure and includes the techniques of vertebroplasty and kyphoplasty in which certain types of spinal fractures are managed. 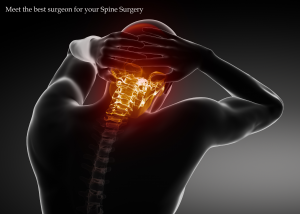 Surgery performed in order to produce spinal analgesia are also often performed by neurosurgeons. Some of these techniques include implantation of deep brain stimulators, spinal cord stimulators and pain pumps. Surgery of the peripheral nervous system is also possible, and includes the very common procedures of carpal tunnel decompression and peripheral nerve transposition. Numerous other types of nerve entrapment conditions and other problems with the peripheral nervous system are treated as well. Triplets born to Omani Nationals Mr. Khamis & Mrs. Aisha after successful IVF treatment from Lifeline Multispeciality, Hospital, Kerala. Mr. Khamis traveled all the way from Oman to Lifeline to share his overwhelming Joy with Dr. Pappachan and Staff. We congratulate and salute the proud parents for their efforts. The goal of cosmetic surgery is to improve a person’s appearance and, thus, self-esteem by changing the way she or he looks. Cosmetic surgery can be performed on any part of the face and body. It is a specially equipped hospital area designed for the treatment of patients with sudden life-threatening conditions. CCUs contain resuscitation and monitoring equipment and are staffed by personnel specially trained and skilled in recognizing and immediately responding to cardiac and other emergencies. See also intensive care unit. Critical care nursing is that specialty within nursing that deals specifically with human responses to life-threatening problems. A critical care nurse is a licensed professional nurse who is responsible for ensuring that acutely and critically ill patients and their families receive optimal care. Critically ill patients are defined as those patients who are at high risk for actual or potential life-threatening health problems. The more critically ill the patient is, the more likely he or she is to be highly vulnerable, unstable and complex, thereby requiring intense and vigilant nursing care. According to “The Registered Nurse Population” study, 56.2% of all nurses work in a hospital setting, and critical care nurses work wherever critically ill patients are found — intensive care units, pediatric ICUs, neonatal ICUs, cardiac care units, cardiac catheter labs, telemetry units, progressive care units, emergency departments and recovery rooms. Increasingly, critical care nurses work in home healthcare, managed care organizations, nursing schools, outpatient surgery centers and clinics. Critical care nurses practice in settings where patients require complex assessment, high-intensity therapies and interventions and continuous nursing vigilance. Critical care nurses rely upon a specialized body of knowledge, skills and experience to provide care to patients and families and create environments that are healing, humane and caring. Respect and support the right of the patient or the patient’s designated surrogate to autonomous informed decision making. Intervene when the best interest of the patient is in question. Help the patient obtain necessary care. Respect the values, beliefs and rights of the patient. Provide education and support to help the patient or the patient’s designated surrogate make decisions. Represent the patient in accordance with the patient’s choices. Support the decisions of the patient or designated surrogate, or transfer care to an equally qualified critical care nurse. Intercede for patients who cannot speak for themselves in situations that require immediate action. Monitor and safeguard the quality of care the patient receives. Act as a liaison between the patient, the patient’s family and other healthcare professionals. Critical care nurses work in a wide variety of settings, filling many roles including bedside clinicians, nurse educators, nurse researchers, nurse managers, clinical nurse specialists and nurse practitioners. With the onset of managed care and the resulting migration of patients to alternative settings, critical care nurses are caring for patients who are more ill than ever before. Managed care has also fueled a growing demand for advanced practice nurses in the acute care setting. Advanced practice nurses are those who have received advanced education at the master’s or doctoral level. In the critical care setting, they are most frequently clinical nurse specialists (CNS) or acute care nurse practitioners (ACNP). A CNS is an expert clinician in a particular specialty — critical care in this case. The CNS is responsible for the identification, intervention and management of clinical problems to improve care for patients and families. They provide direct patient care, including assessing, diagnosing, planning and prescribing pharmacological and nonpharmacological treatment of health problems. WHITESTAR COLD PHACO Technology of Signature system is clinically proven to produce clearer corneas on post-op day 1. This is one of its types as it can perform Phacoemulsification and Posterior Vitrectomy with the same system. © 2015 Global Treatment Services Pvt Ltd.